Canada Map Showing Provinces and territories of Canada and international and provinces boundries. 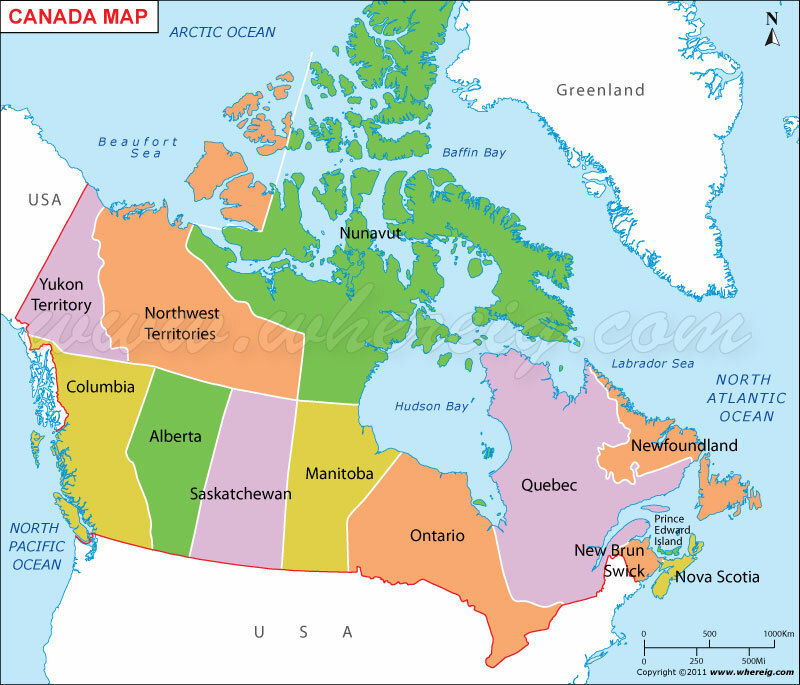 Canada map also shows that it has huge geographical area extends from the Pacific Ocean in the west to Atlantic Ocean in the east; in the northern side it also makes coastline with Arctic Ocean. In terms of area, Canada is worlds second largest country after Russia. Canada shares international boundary with USA; in northwest part Canada has separate international boundary with USA one of the newest states Alaska. The vast area of Canada is occupied by various ethnic groups; some of them are aboriginals and some of them are settled there. However, there are two important groups i.e. French people concentrated in Quebec region and English people in rest part of the Country. At present, Canada is a federation, which has a parliamentary democracy and a constitutional monarchy with Queen Elizabeth II as its head of state. In spite of having large area and diversified climates, Canada is one of the most developed countries of the world. Of course, the reason behind this is that Canada has huge reserve of natural recourses along with potential hydro-electric power. Canada is a potential member of many international organizations including UN, G7, G8, G20, OECD, WTO, NATO, Commonwealth, Francophonie, OAS, and APEC. Not only this, Canada is the eighth-highest Human Development Index globally and it has one of the highest standards of living in the world.